Automation Server operates within a corporate system architecture which includes software and assets which are not provided by Bizagi Ltd. Such software and assets are covered in this section as system prerequisites. A RDBMS in which your Bizagi project stores the process models and related business data. The process repository is a database which Bizagi creates, and which resides in a pre-configured instance of a database engine (a database server). 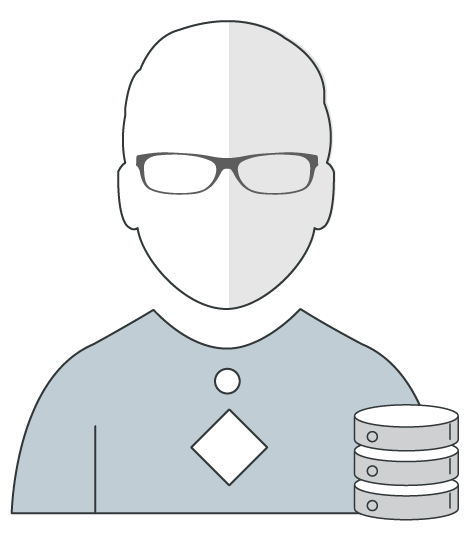 The database can be set in a database cluster to support fault tolerance (or to support scalability if using technologies supporting active-active schemes, such as Oracle RAC). A server having a .NET platform (having an IIS), on which Automation Server is installed. For high availability and scalability, you can set up a Bizagi cluster with multiple nodes having Automation Server, set behind a load balancer. •Work portal: A web-based portal where end users log in and work on processes. Bizagi Work portal is set as a web application in a web server (IIS). •Scheduler: An agent run by Bizagi as a Windows service. It runs system maintenance and offline and asynchronous tasks. You can schedule the tasks to run in batches. 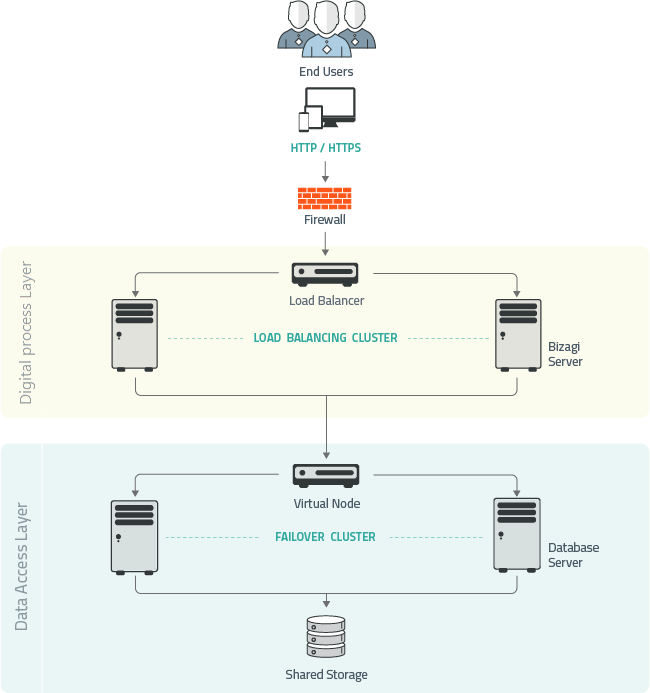 •A load balancer, to support high availability of the solution (as a scalability measure for the Bizagi cluster). •An HTTP server, to support reverse proxy capabilities (for internet access to Bizagi). •A database replica, set to be an ODS (Operational Data Store), to enhance availability of data for reports or daily transactions. •A file server or an ECM system to store files and documents. •Any other corporate systems or servers integrated with the Bizagi processes, such as: An LDAP server or Identity provider system to enable integrated authentication, an SMTP server for notifications, a SAP system, an ESB providing integration services, servers publishing web services, or separate databases. 1. 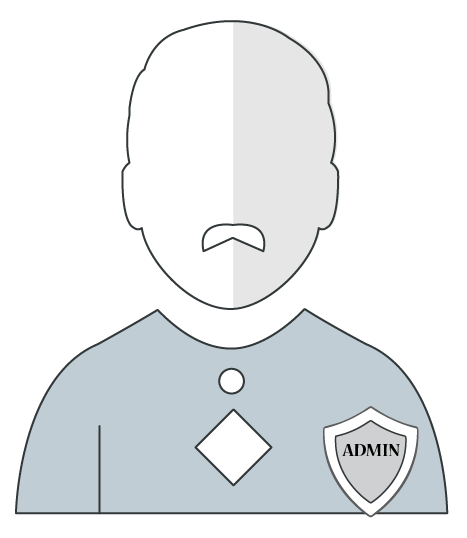 A database administrator (DBA). Should have specific expertise in the database engine (SQL Server or Oracle) that you are using. Should have specific expertise regarding the web server you are using, as well as expertise about the operating system on which it runs. Similarly, this profile should be able to handle, redirect or escalate subjects related to any additional infrastructure or systems involved, such as the load balancer's configuration, a proxy server, DNS configuration, etc. Should know about the implemented processes and all parameters and variables affecting the Bizagi operating environment. Should lead the deployment plan of processes as well as their upgrades into new versions and, have full rights in Bizagi for the administration options. 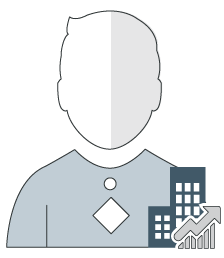 This role can be taken by a leading business analyst or architect.